While scholars of necromancy debate the very existence of Rils, none of them doubt that there are numerous tombs, sanctums and dungeons that are allegedly his handiwork. The scholars who accept that Rils existed believe that because of his devotion to knowledge, he created numerous repositories holding his scrolls and books. They also claim that Rils did not wish his knowledge to fall into unworthy hands or to be acquired too easily. As such, these repositories are supposed to be well guarded and thoroughly trapped. Others claim that he created these places as deathtraps to slaughter those who might someday challenge his power. Still others speculate that some of his tombs and sanctums were created to imprison and torment failed students. Rils’ actual fate and motives (assuming he existed at all) are not recorded in history. Some scholars believe that he was destroyed by adventurers who mistook him for an evil lich. Others contend he was destroyed by adventurers because he was an evil lich. Some say that he still exists and dwells within a vast underground library, penning necromantic tomes. Whatever the truth, from time to time the location of one of Rils’ alleged repositories is discovered and adventurers brave the dangers within. Sometimes, it is said, Rils himself takes a hand in guiding potential necromancers…perhaps to power…perhaps to doom. 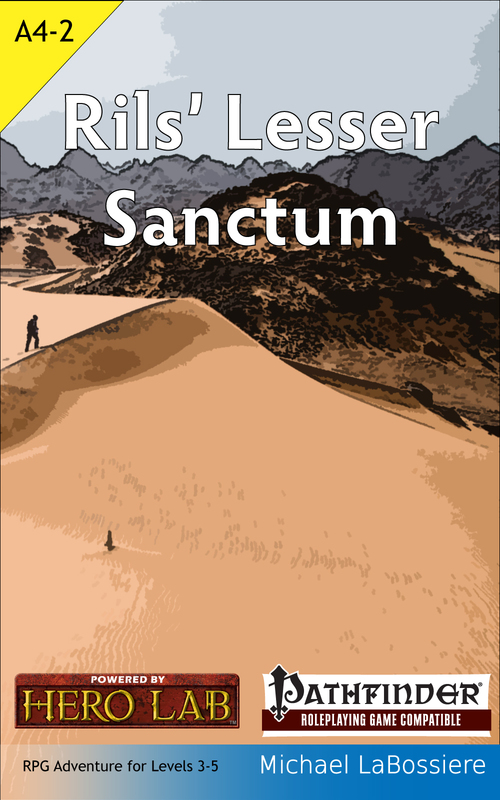 Rils’ Lesser Sanctum is a Pathfinder Role Playing Game compatible adventure. It is intended for a party of 3rd-5th level characters. It is written to follow Tomb of Rils, but can be run as a stand-alone adventure. New spells (Animate Desert Zombies, Animate Burning Skeletons, and Bone Dance). New Magic Items (Binding Bracers, Mummy Unguent, Lesser Necromantic Mask, and Swarm Stone). Available at the Paizo store.